There’s a trick to technical interviews. Every question is looking for integrity first, and intelligence and energy second. This is paraphrasing Warren Buffet, who became the most successful investor out there by becoming the best at interviewing the management of the companies he was investing in. To understand what answers are right you need to understand the motives of the interviewer. Why are they asking these questions, what are they looking for? Yes, you can cram for an interview and hope you get more questions right, but that isn’t what’s going to make or break you. It may help you represent yourself as more of a subject-matter expert than you are, which can be both good and very, very bad. What they’re looking for is someone who can be a good employee a lot more than someone who can currently pass a written exam. In the end, if you don’t know how to answer a question I know you can go look it up. However, what integrity do you have when you don’t know the answer? This is where all those years you spent in school are going to fail you, miserably. You’ve been taught from a young age that you need to have an answer for every question on the test, even if it’s because you’ll get 25% of them right on multiple choice or 10% partial credit on something else. Interviewers, like your teachers, know the answers they’re looking for before the question was asked. However, interviewers are different in that they give negative credit instead of partial credit. So, what is this negative credit and why are they giving it to you? Lets look at it from the context of being on the job. I’m a Database Administrator, and I have developers ask me questions from time to time. Many times I know the answers and can help them out off the top of my head, we’re not going to worry about those times. The problems come from when I don’t know or I’m unsure of the answer. Do I have the integrity to tell that developer I don’t know? If I don’t, will they build the world upon inaccurate information and end up with a world that needs to be torn down and rebuilt? One of these answers cost a little bit of time to look it up. I’m not going to try to put an estimate on the cost of the other answer. Interviewers don’t like it when you know all the answers because of this, and a good interviewer is going to have a question or two they can bring up that no one would know the answer to off the top of their head for this very reason. Yes, they do like it when you know a lot of answers, but more importantly they want to know what type of integrity and mindset you have when you don’t know. The right answer if you’re uncertain is to say you would need to verify it, but here’s my answer and here’s how I’d check it. The right answer if you have no clue is “I don’t know”, hopefully followed up by where you would start to look for answers. In both cases, you write down the question, look it up after the interview, and be ready to answer it next time. If you want bonus points, and who can’t use bonus points in this situation, you’ll email your interviewer the next day and say that you looked into the question and here’s the right answer. Now you’re acting like the ideal employee. You maintained integrity by saying you either didn’t know or weren’t certain of the answer, which couldn’t have done a better job showing you had the integrity Warren Buffet was referring to. Then you followed up with the energy to gain the intelligence to answer it better. On the answers you know, be it ones you knew all along or ones you crammed for, you fulfilled one of the lessor criteria that Warren Buffet would look for. On the answers you don’t know you instantly fulfilled the most important criteria if you admitted you didn’t know, then you had the opportunity to throw in the other two criteria on a follow up. Here’s the problem. Every good employee is a teacher, and you’re better off without a teacher if their lessons are wrong. A good interviewer is looking for a good teacher more than a know-it-all. Speaking of being a teacher, how do you answer the questions you do know very well? Chances are you know how to answer them in a way that someone else who knows the answer would understand. However, they want to know if you could teach someone else the answer, even if that person doesn’t have your specialty. Make sure you can teach them the right answer in an interview when you understand it well enough, especially if it’s a common question they’ll ask at every interview. Back to my Database Administrator background, every interview I’m in someone will ask what the primary types of indexes are in SQL. The “right” answer is that a clustered index is the table itself in a sorted order, and a nonclustered index is a subset of that data which is also sorted. This is good, they understood my answer and know that indexes aren’t something new to me. However, if you’re talking to someone on the job who doesn’t specialize in SQL Server, how well are they going to understand and remember this answer? There are other questions you can expect in interviews, too. “Tell me about yourself”, “Where do you expect to be in 5 years”, and so on. I’m not going to pretend to be a good list of all the common questions, but I can tell you how to prep for them. Again, think about it from the interviewer’s perspective. “Tell me about yourself” is obviously a very vague question. I hate it this question, but it still gets asked. I view it from the standpoint that they want to see how you handle vague questions. Do you just ramble on about your kids and dog or do you clarify what they are asking? Do you have the ability to break this down into something specific and get to the right answer? On my job people will often come to me and say “the server is slow”, which I have to break down into pieces until I can start asking the right questions and answers. Now I’m taking a “why would you ask this” question and demonstrating what they want to see in an employee. “Where do you expect to be in 5 years” is also every common, and they aren’t expecting you to be a fortune teller here. Also, I wouldn’t expect someone to try to commit to being with my company for that length of time before they’re even offered the job. What else could an interviewer be hoping for? They just want a direction. Are you excited about what you’re doing and have the drive to keep learning? Do you want to make the jump from technical employee to manager, which would start another conversation with the stated goal still being to look for the energy to improve yourself and be a continually better asset to the company. If you don’t know what career you want to have in 5 years then you can’t be expected to have the energy to improve your abilities at your current career. Here’s some more you should know before an interview, but I’ll be brief since it goes beyond the scope of this post. When people ask you questions in an interview, do you exude the following? Humble – If someone asks you to rate yourself on anything from 1 to 10 then 10 is not an option. Even 9 is arrogant unless you’re known around the world for your skill. Too high and you’re too confident, won’t take criticism, and, my personal favorite, you’re done learning because you think you know it all. Hunger or Drive – You want to keep bettering yourself, both in work and out. You want something a little above your skill level because you’ll be there soon. Energy – If the interviewer is good, they’ll ask you questions you don’t know no matter how good you were. Did you come back with a solution after the interview? Communication – How were you able to answer the questions you got right? Were they just technically right, or did you put off the impression that you could help others get to your level? Leadership – Chances are you aren’t interviewing for a management position, but management isn’t leadership. Are you showing that you can take an idea and run with it, asking others for help as you go, and making sure it’s right without someone looking over your shoulder the whole time? Managers want to do more than stand around holding a bullwhip, they want to watch people fly on their own with ground control giving a little direction. These questions are being asked now in the context of an interview, but you should be asking yourself these things in your continual career planning phase as well. “Tell me about yourself”, can you break down large issues and find the root of the problem, and do you care enough about what you’re doing to get down into the details and root causes? “Where do you expect to be in 5 years”, do you care enough about this career path to make yourself a better you? If you don’t have good answers to these questions for yourself then where do you want to be? Figure that part out and you’ll have a better chance at finding the career you want to do. And don’t forget to consider the integrity of your answers when coworkers look towards you for guidance. Do you give each answer your best shot off the top of your head, or do you tell them you would have to look it up and follow up with the right answer after you do? Following this advice you’ll be a lot closer to the ideal employee the interviewers are looking for, then all you have to do is walk into the interview and be yourself. 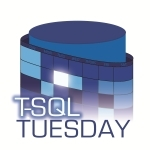 This post was already in the works before I found out it was the topic for this month’s T-SQL Tuesday led up by Boris Hristov (b | t) on Interviews and Hiring. This is an amazing coincidence for both of us. For me, it gives me more visibility on this post, which I think a lot of people could benefit from. For you, it gives you a couple links in this paragraph to exercise your hunger to better yourself. Just remember that a lot of what you see is going to be how to get a job, but you can skew it to how to be better at your job and evaluate where you want to be. I’m glad you liked it. Hopefully you’re able to apply this on the job as well as in an interview, too. Excellent article. The “community” appreicates your insight. You know, I have followed these tips and advice for some time now. Many times, you can do everything correctly, and you will still not get the position. I am sorry to say that your age does matter, and there isn’t anything you can really do about that. I wish more hiring managers would read this article because they miss out on many good employees, because they don’t know WHAT a good employee is all about. I agree that age does matter in the IT world to the point that I’ve seen seasoned pros advised to only put the last 10-15 years of experience on their résumés, and it’s pathetic. I’m a firm believer in diversity, and a team where everyone is in their 30’s isn’t going to see issues from every angle. Give me a mix of everything you have, not just age, and I’ll give you a better IT team. I want the young energy to learn from the seasoned pros, fresh minds to understand the tried-and-true methods, and any other way you want to word it still comes out as a positive from my point of view. Even then, this is only referring to age. There is more to it than that with discrimination against other groups where all groups have a slightly different way of looking at issues. Every extra angle I can have an issue looked at is an extra chance to get it right.